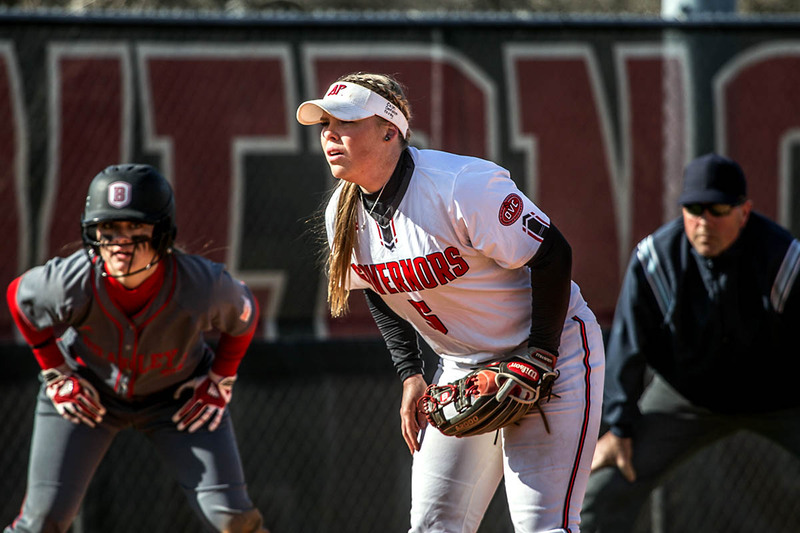 Macon, GA – Austin Peay State University’s softball team loaded the base in the top of the seventh inning versus Mercer, Sunday at Sikes Field, but couldn’t come up with a big final hit, as the Govs saw their nine-game win streak come to and end with a 3-1 loss. Trailing by two, the Govs (15-8) got a lead-off single from Carly Mattson to open the seventh inning and an out later moved around to third base on a single by Kelsey Gross and a walk to Brooke Pfefferle. Mattson, Gross and Morgan Rackel would all finish the contest with two hits each. But Mercer (19-10) would cut Mattson down at the plate on a fielder’s choice for the second out followed by a foul out by Kacy Acree to end the game. Rackel (7-3) was the hard-luck loser in the game, giving up just six hits and one earned run in six innings of work. She also struck out nine and issued no walks. The Bears jump out to a 2-0 lead in the bottom of the first, taking advantage of two hits and an APSU error, while making it 3-0 in the second with a home run. The Govs would get on the board in the top of the fourth inning on Danielle Liermann‘s 10th home run of the season to cut the deficit to a two-run contest. Austin Peay has one more mid-week doubleheader before opening Ohio Valley Conference play this coming weekend, with a 3:00pm, Wednesday, doubleheader at Cheryl Holt Field versus Lipscomb. The loss versus Mercer was the first for the Govs this season when they outhit their opponent. The two hits by Kelsey Gross was her first multi-hit game of the season. Danielle Liermann‘s home run versus Mercer gives her 26 for her career, tying her with Lauren de Castro for second-place all-time in school history. With her nine strikeouts versus Mercer, Morgan Rackel has recorded at least nine strikeouts in four of her last six pitching appearances. Austin Peay finishes its five in-season tournaments with an overall record of 13-8.